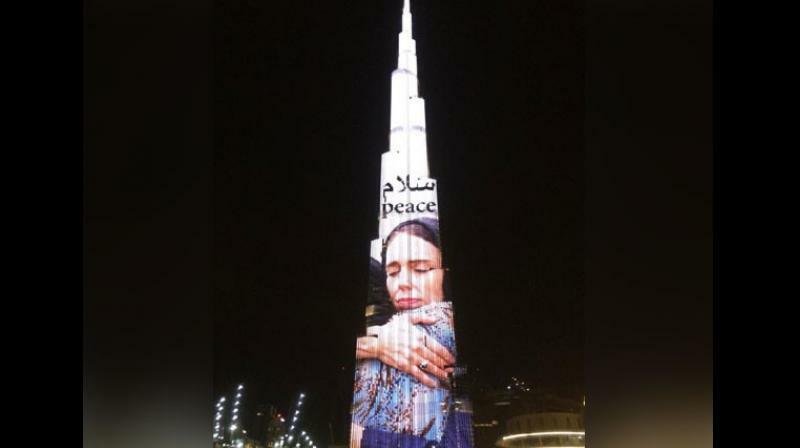 Dubai: New Zealand Prime Minister Jacinda Ardern's hijab-clad picture was projected on the world's tallest building, the Burj Khalifa, on Friday night in gratitude for the support shown by the leader towards the Muslim community in the aftermath of last week's Christchurch terror attacks. "New Zealand today fell silent in honour of the mosque attacks' martyrs. Thank you PM @jacindaardern and New Zealand for your sincere empathy and support that has won the respect of 1.5 billion Muslims after the terrorist attack that shook the Muslim community around the world," Sheikh Mohammed bin Rashid Al Maktoum, the Prime Minister of UAE tweeted. Meanwhile, in New Zealand, the victims of the gruesome Christchurch terror attacks were laid to rest in a mass burial on Friday, after the Muslim call to prayer was sounded. Friday marked exactly one week since the terror attacks claimed the lives of 50 people after a shooter attacked two mosques during prayers on March 15. A two-minute silence was observed across the state on Friday, as thousands formed a human chain around a mosque in Wellington as a symbolic act of protection of the Muslim community during 'Jumu'ah' or the Friday Prayer. New Zealand has put forth a united front in the wake of the attacks, with Ardern showing her unrelenting support to the Muslim community which was targeted by a white man, who is thought to be the perpetrator. He has been remanded in custody without plea until April 5.